No one can predict the future, and numerous variables can be manipulated to produce desirable cost estimates for massive long-term infrastructure projects. But there’s no doubt that California High-Speed Rail will be the most expensive construction project in human history if it is ever completed. Even if bond rates do not significantly rise in the next 15 years or if the state never ends up selling Capital Appreciation Bonds to pay for the system, the debt burden on future generations of Californians who have to pay back all that borrowed money (plus interest) will be astronomical. 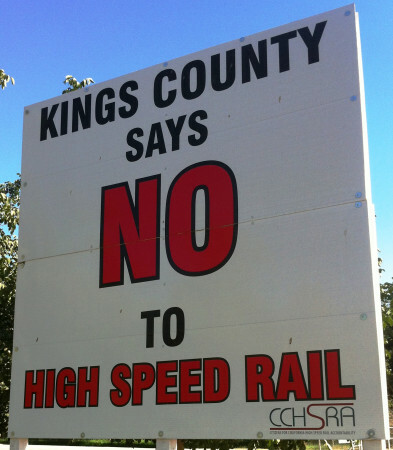 Therefore, you voted for or against Proposition 1A based on that estimate for a high-speed rail system connecting San Francisco, Los Angeles, San Diego, and Sacramento. Not surprisingly, the political and business leaders backing California High-Speed Rail were stunned when the California High-Speed Rail Authority released its draft business plan for 2012 estimating a cost of $98 billion. That’s more than double what voters were told. Two years later, the California High-Speed Rail Authority released a new 2014 business plan that actually reduced the cost estimate to $67.6 billion for the alignment between San Francisco and Los Angeles. Reportedly the slight reduction was a result of projecting a lower inflation rate, although that does not seem to reflect reality in the costs of property acquisition, construction labor, and infrastructure materials. We think a more accurate estimate was produced in July 2012 by California Common Sense, a policy analysis program in Los Altos. It assumed meager federal funding and took into account the long-term interest the state would pay on money borrowed through bond issues. That cost estimate was $203 billion. Does this huge number sound outlandish? It’s not. A Senate Appropriations Committee legislative analysis in 2008 estimated the interest California taxpayers would have to pay for borrowing $9.95 billion for the High-Speed Rail project through bond sales. The Safe, Reliable High-Speed Passenger Train Bond Act for the 21st Century is the only bond act currently qualified to appear on the November 2008 statewide ballot. If all $9.95 billion worth of G.O. bonds are issued and sold as 30-year bonds at an average interest rate of 5%, the total principal and interest cost over this period is $19.4 billion, or $647 million of debt service per year for 30 years. …if the term of bond maturity is extended from 30 years to 40 years, assuming 5 percent interest and 3 percent inflation. Annual General Fund debt service payments (assuming they are level over the term) would be $580 million for 40 years, rather than $647 million annually for a 30 year term, but the total debt service would be $23.195 billion for 40 year bonds, rather than $19.418 billion for 30 year bonds. These figures are in current dollars. In short, Proposition 1A will actually cost taxpayers $19 billion to $23 billion even though the amount cited to voters was the $9.95 billion that would be borrowed through bond sales.